There exists an absolutely reliable process at the core of life that you can always count on for your inevitable growth and success. Imagine a dynamic energy vortex spiraling at the core of your being, at the core of existence. That spiral works in you, in your relationships, in your business, finances and life-understanding. Think of it as a progressive energy pattern continually expanding. It drives plants to grow; it drives you and I to fulfill our greater potential. It is �pushing� your entire life into more and more magnificence. Because of this intrinsic spiral pattern of evolution at the core of life you really have nothing to worry about. In fact, worry places you in conflict with this all-supporting pattern of ongoing life-improvement. When we worry, we resist life. We imagine what can go wrong. This creates the very difficulties that we worry about. As we learn to entirely trust this spiral pattern of inevitable evolution, we progress more easily and enjoyably into increasingly wonderful life-conditions. We allow our progress into more profound levels of authentic success by trusting the inner spiral. Whether one feels disappointed or enthused, insecure or confident, grateful or resentful really comes down to the perspective that one chooses to adopt. Feelings of anxiety, frustration and disappointment are based solely on appearances or upon the false inferences that we draw from those appearances. A business person loses a big client. He may go into grief. But what is that based on? It's based on the assumption that things are going down, not up. If we really understood what was happening, when we arrive at a problem or obstacle we would celebrate and feel a sense of relief, saying something to ourselves like, "I can ease up. At long last I have arrived at the threshold of a breakthrough. Significant improvement of my circumstances is at hand!" A problem is nothing to fight against. It's something to relax toward, because a relaxed approach to problem solving permits the spiral to solve your problem for you and produce a positive breakthrough. Anxiously struggling to push or force things to work out is really a way of pushing against the improvement of your circumstances. When centered in peace, with a worry-free mind, you allow the spiral of evolution at the core of what is happening to do its work. You allow things to improve. This characterizes the foundation of Inner Peace Leadership. Inner Peace Leadership means that you lead from peace, peace grounded in trust, trust in the spiral. To practice Inner Peace Leadership, trust that everything in your life really �wants� to get better. 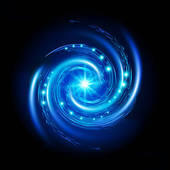 Try to "tune in" to the feeling of this spiral at work in your life in the present moment. See if you can relax to it. To enter a leadership position relative to the spiral means to step out in front of it. You do this by envisioning the specific improvements that you want to happen. In a relaxed, unforced way, simply open your heart and mind to contemplate the outcomes you desire. The spiral will follow your will and commence forming your vision. That formation occurs organically. There's no rushing it and no need to rush it. Your inner vision �informs� the energy spiral of evolution of the specific course it is to follow in your life. Once you decide on what you want, the spiral begins working in that direction. By working with the spiral, in a calm, confident and unforced manner, you effectively lead the process. Inner Peace Leadership makes leading our lives a more enjoyable AND a more successful experience. Leading with stress and strain creates unhappy blockages to success. If you come upon an impasse at any stage along the way to any of your objectives, the time has come to relax and to celebrate, because a positive breakthrough is at hand. You can help the breakthrough along through Evolutionary Problem Solving. Coming Soon: Part 2 of Inner Peace Leadership Skills: Evolutionary Problem Solving. Develop the leadership skills and problem solving prowess of your managers, supervisors, team leaders and general workforce with Great Leadership Development Motivational Seminars. Call 404-297-4043 or email for more information.